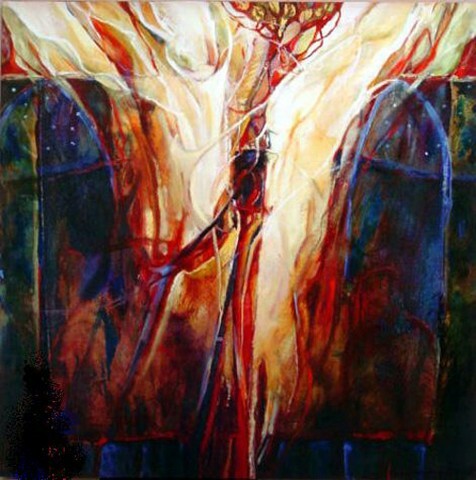 This giclee on canvas was reproduced from a mixed media painting of torn canvas on a 48" x 48" panel. It was part of my Christmas Invitational at the Asheville Art Museum and part of my Torn Veil series. Each giclee print is unique with hand-applied gold leaf. The fiery torso that descends into our darkness is a covering of glory, a robe of righteousness. It was inspired by and takes its title from the Advent poem by Suzanne Rhodes.